January 1, Juche 107 (2018) Dear fellow countrymen and brave service personnel of the People’s Army, Dear compatriots, Today, recollecting with great pleasure and pride and deep emotion the proud achievements we performed last year through our diligent and worthwhile labour and sincere efforts and by the sweat of our brow, we are all seeing in the new year 2018 with fresh hopes and expectations. Greeting the hope-filled new year, I wish the families across the country good health, happiness, success and prosperity. I also wish that the beautiful dreams of all our people, including the hopes of our children in the new year, would come true. Comrades, As I look back upon last year, when I worked strenuously on the road of achieving national prosperity, gaining great strength and wisdom from the pure minds of the dauntless people who invariably trusted and followed the Party even in the face of manifold difficulties and trials, I feel my heart swelling with the pride in waging the revolution shoulder to shoulder with a great people. On behalf of the Workers’ Party of Korea and the government of the Democratic People’s Republic of Korea, I extend sincere thanks and New Year greetings to all the people and service personnel who won miraculous victories to be noteworthy in the national history of 5 000 years by sharing mind and purpose with the Party and supporting its determination on the road of arduous yet glorious struggle. My New Year greetings go also to the compatriots in the south and abroad who are fighting for the reunification of the country and to the progressive peoples and other friends across the world who opposed war of aggression and gave firm solidarity to our cause of justice. Comrades, The year 2017 was a year of heroic struggle and great victory, a year when we set up an indestructible milestone in the history of building a powerful socialist country with the spirit of self-reliance and self-development as the dynamic force. Last year the moves of the United States and its vassal forces to isolate and stifle our country went to extremes, and our revolution faced the harshest-ever challenges. In the face of the prevailing situation and the worst trials on the road of advance, our Party trusted the people and the people defended the Party death-defyingly, turning adversity and misfortune to good account and achieving brilliant successes on all the fronts where a powerful socialist country is being built. Through last year’s grandiose struggle we powerfully demonstrated at home and abroad our immutable faith and will to follow to the end the road of Juche-oriented socialism opened up by the great ComradesKim Il Sung and Kim Jong Il and the single-hearted unity of socialist Korea in which all the people are firmly united behind the Party. An outstanding success our Party, state and people won last year was the accomplishment of the great, historic cause of perfecting the national nuclear forces. On this platform one year ago I officially made public on behalf of the Party and government that we had entered the final stage of preparation for the test launch of an intercontinental ballistic missile. In the past one year we conducted several rounds of its test launch, aimed at implementing the programme, safely and transparently, thus proving before the eyes of the world its definite success. By also conducting tests of various means of nuclear delivery and super-intense thermonuclear weapon, we attained our general orientation and strategic goal with success, and our Republic has at last come to possess a powerful and reliable war deterrent, which no force and nothing can reverse. Our country’s nuclear forces are capable of thwarting and countering any nuclear threats from the United States, and they constitute a powerful deterrent that prevents it from starting an adventurous war. In no way would the United States dare to ignite a war against me and our country. The whole of its mainland is within the range of our nuclear strike and the nuclear button is on my office desk all the time; the United States needs to be clearly aware that this is not merely a threat but a reality. We have realized the wish of the great leaders who devoted their lives to building the strongest national defence capability for reliably safeguarding our country’s sovereignty, and we have created a mighty sword for defending peace, as desired by all our people who had to tighten their belts for long years. This great victory eloquently proves the validity and vitality of the Party’s line of simultaneously conducting economic construction and building up our nuclear forces and its idea of prioritizing science, and it is a great historic achievement that has opened up bright prospects for the building of a prosperous country and inspired our service personnel and people with confidence in sure victory. I offer my noble respects to the heroic Korean people who, despite the difficult living conditions caused by life-threatening sanctions and blockade, have firmly trusted, absolutely supported and dynamically implemented our Party’s line of simultaneously promoting the two fronts. My warm, comradely greetings go also to our defence scientists and workers in the munitions industry who made devoted efforts all the year round, to demonstrate to the world that the plans and decisions of the Party Central Committee are a science and a truth and that they automatically mean their materialization. Last year we also made notable headway in carrying out the five-year strategy for national economic development. As a result of our vigorous endeavour to establish the Juche orientation in the metallurgical industry, an oxygen-blast furnace of our own style was built at the Kim Chaek Iron and Steel Complex to maintain regular production of pig iron by relying on anthracite, and prospects were opened up for consolidating the independent foundations of the chemical industry and attaining the five-year strategy’s goal for the output of chemical products. Numerous light-industry factories in such sectors as textile, footwear, knitwear and foodstuff industries raised high the banner of Juche orientation and made proactive efforts to propel the modernization of several production lines by means of our own technology and our own equipment. By doing so, they provided a guarantee for making the range of consumer goods varied and improving their quality. The machine-building industry, by upholding the banner of self-reliance and relying on science and technology, creditably attained the Party’s goal for the production of new-type tractors and trucks, and thus laid solid foundations for speeding up the Juche orientation and modernization of the national economy and the comprehensive mechanization of the rural economy. The agricultural sector, by actively introducing scientific farming methods, increased the ranks of high-yield farms and workteams and reaped an unusually rich fruit harvest in spite of unfavourable climatic conditions. Our service personnel and people built magnificent Ryomyong Street and the large-scale livestock farming base in the Sepho area, and completed the task for the first stage of the forest restoration campaign, thereby demonstrating the might of great army-people unity and the potential of the socialist independent economy. Amid a vigorous struggle for the creation of the Mallima speed, new model units emerged one after another, and a large number of factories and enterprises fulfilled their quotas of the yearly national economic plan ahead of schedule and made a proud achievement of surpassing their peak-year levels. Successes were also made on the scientific and cultural fronts last year. Scientists and technicians resolved scientific and technological problems arising in the building of a powerful socialist country and completed research projects in the cutting-edge field, thereby giving stimulus to economic development and the improvement of the people’s living standards. The socialist education system was further improved and the educational environment upgraded, while medical service conditions were bettered. An example of artistic performance activities was created to infuse the whole country with revolutionary optimism and the militant spirit, and our sportspeople won victories in different international competitions. All the successes made last year are the triumph of the Juche-oriented revolutionary line of the Workers’ Party of Korea and a precious fruition of the heroic struggle of the service personnel and people who are firmly rallied behind the Party. Our Party and people achieved such signal victories others could never think of achieving by their own efforts in the face of the sanctions-and-blockade moves the United States and its vassal forces perpetrated more viciously than ever before to stamp out the rights to sovereignty, existence and development of the DPRK. Herein lies the source of their dignity and their great pride and self-confidence. I would like to extend my warm thanks once again to all the people and service personnel who victoriously advanced the cause of building a powerful socialist country, always sharing the destiny with the Party and braving all difficulties and trials on the eventful days of last year. Comrades, This year we will mark the 70th anniversary of the founding of the glorious Democratic People’s Republic of Korea. To mark the 70th anniversary of their state with splendour is of real significance for the great people, who have raised with dignity the status of their socialist country, the greatest patriotic legacy of the great Comrades Kim Il Sung and Kim Jong Il, to that of a strategic state recognized by the world. We should make constant innovations and continued progress until we win the final victory of the revolution by carrying on the tradition of heroic struggle and collective innovation which adorned the founding and course of development of Juche Korea. A revolutionary general offensive should be launched to achieve fresh victory on all fronts of building a powerful socialist country by taking the historic victory in the building of the DPRK’s nuclear forces as a springboard for fresh progress. “Let us launch a revolutionary general offensive to achieve fresh victory on all fronts of building a powerful socialist country!”‒this is the revolutionary slogan we should uphold. All officials, Party members and other working people should launch an all-people general offensive to frustrate the challenges of the hostile forces who are making last-ditch efforts and raise the overall strength of our Republic to a new stage of development as they brought about a great upsurge in socialist construction overcoming all difficulties through the great Chollima upswing after the war. A breakthrough should be made in reenergizing the overall economic front this year, the third year of implementing the five-year strategy for national economic development. The central task facing socialist economic construction this year is to enhance the independence and Juche character of the national economy and improve the people’s standard of living as required by the revolutionary counterstrategy put forward by the Second Plenary Meeting of the Seventh Central Committee of the Party. We should concentrate all efforts on consolidating the independence and Juche character of the national economy. The electric-power industry should maintain and reinforce the self-supporting power generation bases, and direct a great deal of efforts to developing new power sources. A dynamic campaign should be conducted to drastically increase thermal power generation, and lower the loss of electric power and increase its production as much as possible by maintaining and reinforcing imperfect generating facilitates. Provinces should build power generation bases to suit their local features and put power generation at the existing medium and small-sized power stations on a normal footing to satisfy the needs of electric power for local industry by themselves. Alternated production should be organized scrupulously throughout the country, and a vigorous struggle waged against the practices of wasting electric power to make effective use of generated electric power. The metallurgical industry should further improve the Juche-oriented iron- and steel-making technologies, increase the iron production capacity and drastically raise the quality of metallic materials in order to satisfy the needs of the national economy for iron and steel. It is necessary to ensure a preferential, planned and timely supply of electricity, concentrated iron ore, anthracite, lignite, freight wagons, locomotives and funds for the metallurgical industry. By doing so, we can fulfil next year’s iron and steel production plans and make the industry Juche-oriented without fail. The chemical industry should step up the establishment of the C1 chemical industry, push the projects for catalyst production base and phosphatic fertilizer factory as scheduled, and renovate and perfect the sodium carbonate production line whose starting material is glauberite. The machine-building industry should modernize the Kumsong Tractor Factory, Sungni Motor Complex and other factories to develop and produce world-level machinery in our style. The coal and mineral production and rail transport sectors should make concerted efforts to make the country’s self-reliant economic foundations prove their effectiveness. Notably, the rail transport sector should make the best use of the existing transport capacity by making transport organization and control more scientific and rational, and maintain discipline and order in the railways as rigid as in the army, so as to ensure an accident-free, on-schedule rail traffic. A turn should be brought about this year in improving the people’s standard of living. Light-industry factories need to transform their equipment and production lines into labour- and electricity-saving ones and produce and supply more diversified and quality consumer goods with domestic raw and other materials, and provinces, cities and counties should develop the local economy in a characteristic way by relying on their own raw material resources. The agricultural and fishing fronts should effect an upswing. We should introduce seeds of superior strains, high-yield farming methods and high-performance farm machines on an extensive scale, do farming scientifically and technologically so as to fulfil the cereals production plan without fail, and boost the production of livestock products, fruits, greenhouse vegetables and mushrooms. We should enhance our ship building and repair capacities, launch scientific fishing campaigns, and reenergize aquatic farming. This year the service personnel and people should join efforts to complete the construction of the Wonsan-Kalma coastal tourist area in the shortest period of time, push ahead with major construction projects including the renovation of Samjiyon County, the construction of the Tanchon Power Station and the second-stage waterway project of South Hwanghae Province, and channel steady efforts into the construction of houses. Building on the success we achieved in the forest restoration campaign, we should properly protect and manage the forests that have already been created, improve the technical conditions of roads, conduct river improvement on a regular basis, and protect environment in a scientific and responsible manner. Every sector and every unit of the national economy should enlist their own technical forces and economic potential to the maximum and launch a dynamic struggle to increase production and practise economy, so as to create a greater amount of material wealth. A shortcut to developing the self-sufficient economy is to give precedence to science and technology and make innovations in economic planning and guidance. The scientific research sector should solve on a preferential basis the scientific and technological problems arising in establishing Juche-oriented production lines of our own style, ensuring domestic production of raw and other materials and equipment, and perfecting the structure of the self-supporting economy. Every sector and every unit of the national economy should make a contribution to achieving production growth by intensifying the dissemination of science and technology and waging a brisk technological innovation drive. The Cabinet and other economic guidance organs should work out a realistic operational plan to carry out the national economic plan for this year and push forward the work for its implementation responsibly and persistently. Positive measures should be taken by the state to ensure that the socialist system of responsible business operation proves its worth in factories, enterprises and cooperative organizations. Socialist culture should be developed in a comprehensive way. It is necessary to strengthen the ranks of teachers, improve the contents and methods of education as demanded by the trend of developing modern education, apply the people-oriented character in public health service in a thoroughgoing way, and boost the production of medical equipment and appliances and different kinds of medicines. We should conduct mass-based sporting activities briskly, create sporting techniques and tactics of our own style, and produce artistic and literary masterpieces which truthfully depict the heroic struggle and life of our service personnel and people in the Mallima era and the beautiful and sublime features proper to human beings. In this way, we can crush the bourgeois reactionary culture by dint of our revolutionary socialist art and literature. A vigorous struggle should be waged to tighten moral discipline throughout society, establish a socialist way of life and eliminate all kinds of non-socialist practices, so as to ensure that all the people, possessed of ennobling mental and moral traits, lead a revolutionary and cultured life. The self-reliant defence capability should be further consolidated. In this year of the 70th anniversary of the development of the Korean People’s Revolutionary Army into a regular revolutionary armed force by the great leader Comrade Kim Il Sung, the People’s Army should perfect its features as befits the revolutionary armed forces of the Party. It should organize and conduct combat training in a highly intensive way, in a real-war atmosphere, to develop all its units in different arms, services and corps into the ranks of a-match-for-a-hundred combatants. The Korean People’s Internal Security Forces should sharpen the edge of the sword of the class struggle and detect and frustrate the schemes by undesirable and hostile elements in time. The Worker-Peasant Red Guards and Young Red Guards should enhance their combat capability in all aspects through intensive combat and political training. By consistently holding fast to the line of simultaneously promoting the two fronts in accordance with the strategic policy set by the Party at the Eighth Conference of Munitions Industry, the defence industry should develop and manufacture powerful strategic weapons and military hardware of our style, perfect its Juche-oriented production structure and modernize its production lines on the basis of cutting-edge science and technology. The nuclear weapons research sector and the rocket industry should mass-produce nuclear warheads and ballistic missiles, the power and reliability of which have already been proved to the full, to give a spur to the efforts for deploying them for action. And we should always be ready for immediate nuclear counterattack to cope with the enemy’s manoeuvres for a nuclear war. The political and ideological might is the first and foremost strength of our state and the great propellant for opening up an avenue for building a powerful socialist country. In order to successfully carry out the fighting tasks facing us, we should rally the whole Party more firmly on its organizational and ideological basis and establish a thoroughgoing revolutionary climate within the Party. In this way, we can constantly enhance its fighting efficiency and leadership role in the overall revolution and construction. All Party organizations should never tolerate all shades of heterogeneous ideas and double standards of discipline that run counter to the Party’s ideology, but strengthen the single-hearted unity of the whole Party centred on its Central Committee in every way possible. The whole Party should launch an intense struggle to establish a revolutionary climate within the Party with the main emphasis put on rooting out the abuse of Party authority, bureaucratism and other outdated methods and style of work, so as to ensure that the ties of kinship between the Party and the masses of the people are as solid as a rock. Party organizations should intensify Party guidance to ensure that the work of their respective sectors and units is always conducted in conformity with the ideas and intentions of the Party and the requirements of its policies, and find satisfactory solutions to the problems arising in the building of a powerful socialist country by giving definite precedence to political work and motivating the people ideologically. We should rally all the service personnel and people firmly behind the Party ideologically and volitionally so that they throw in their lot with it whatever the adversity and fight with devotion for the victory of the socialist cause. Party and working people’s organizations and government organs should orient and subordinate all their undertakings to strengthening the single-hearted unity. The benchmark in planning and launching their work should be the people’s demands and interests. And they should go deep among the people, sharing good times and bad with them and solving their mental agony and difficulties in their lives. They should ensure that the shorter the supply of everything is, the fuller play is given to the beautiful traits of comrades and neighbours helping and caring for one another with all sincerity. We should give free rein to the indomitable mental strength of the heroic Korean people on the present grand Mallima march. Party and working people’s organizations should ensure that all the working people cherish patriotism in their hearts and bring about collective innovations one after another in the great campaign to create the Mallima speed with the revolutionary spirit of self-reliance and science and technology as the dynamic force. They should see to it that officials, Party members and other working people carry forward the fighting spirit displayed by the elder generations who brought about epochal changes on the grand Chollima march and all of them become Mallima pioneers who vigorously rush forward in the vanguard of the era. Comrades, Last year, too, our people made strenuous efforts to defend the peace of the country and hasten national reunification in keeping with the aspirations and demands of the nation. However, owing to the vicious sanctions and pressure by the United States and its vassal forces and their desperate manoeuvres to ignite a war, all aimed at checking the reinforcement of the self-defensive nuclear deterrent by our Republic, the situation on the Korean peninsula became aggravated as never before, and greater difficulties and obstacles were put on the road of the country’s reunification. Even though the conservative “regime” in south Korea, which had resorted to fascist rule and confrontation with fellow countrymen, collapsed and the ruling circles were replaced by another thanks to the massive resistance by the enraged people of all walks of life, nothing has been changed in the relations between the north and the south. On the contrary, the south Korean authorities, siding with the United States in its hostile policy towards the DPRK against the aspirations of all the fellow countrymen for national reunification, drove the situation to a tight corner, further aggravated the mistrust and confrontation between the north and the south, and brought the bilateral relations to a fix that can be hardly resolved. We can never escape the holocaust of a nuclear war forced by the outside forces, let alone achieve national reunification, unless we put an end to this abnormal situation. The prevailing situation demands that now the north and the south improve the relations between themselves and take decisive measures for achieving a breakthrough for independent reunification without being obsessed by bygone days. No one can present an honourable appearance in front of the nation if he or she ignores the urgent demands of the times. This year is significant both for the north and the south as in the north the people will greet the 70th founding anniversary of their Republic as a great, auspicious event and in the south the Winter Olympic Games will take place. In order to not only celebrate these great national events in a splendid manner but also demonstrate the dignity and spirit of the nation at home and abroad, we should improve the frozen inter-Korean relations and glorify this meaningful year as an eventful one noteworthy in the history of the nation. First of all, we should work together to ease the acute military tension between the north and the south and create a peaceful environment on the Korean peninsula. 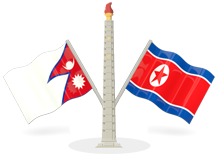 As long as this unstable situation, which is neither wartime nor peacetime, persists, the north and the south cannot ensure the success of the scheduled events, nor can they sit face to face to have a sincere discussion over the issue of improving bilateral relations, nor will they advance straight ahead towards the goal of national reunification. The north and the south should desist from doing anything that might aggravate the situation, and they should make concerted efforts to defuse military tension and create a peaceful environment. The south Korean authorities should respond positively to our sincere efforts for a détente, instead of inducing the exacerbation of the situation by joining the United States in its reckless moves for a north-targeted nuclear war that threatens the destiny of the entire nation as well as peace and stability on this land. They should discontinue all the nuclear war drills they stage with outside forces, as these drills will engulf this land in flames and lead to bloodshed on our sacred territory. They should also refrain from any acts of bringing in nuclear armaments and aggressive forces from the United States. Even though the United States is wielding the nuclear stick and going wild for another war, it will not dare to invade us because we currently have a powerful nuclear deterrent. And when the north and the south are determined, they can surely prevent the outbreak of war and ease tension on the Korean peninsula. A climate favourable for national reconciliation and reunification should be established. The improvement of inter-Korean relations is a pressing matter of concern not only to the authorities but to all other Koreans, and it is a crucial task to be carried out through a concerted effort by the entire nation. The north and the south should promote bilateral contact, travel, cooperation and exchange on a broad scale to remove mutual misunderstanding and distrust, and fulfil their responsibility and role as the motive force of national reunification. We will open our doors to anyone from south Korea, including the ruling party and opposition parties, organizations and individual personages of all backgrounds, for dialogue, contact and travel, if they sincerely wish national concord and unity. A definite end should be put to the acts that might offend the other party and incite discord and hostility between fellow countrymen. The south Korean authorities should not try, as the previous conservative "regime" did, to block contact and travel by people of different social strata and suppress the atmosphere for reunification through alliance with the north, under absurd pretexts and by invoking legal and institutional mechanisms; instead, they should direct efforts to creating conditions and environment conducive to national concord and unity. To improve inter-Korean relations as soon as possible, the authorities of the north and the south should raise the banner of national independence higher than ever before, and fulfil their responsibility and role they have assumed for the times and the nation. Inter-Korean relations are, to all intents and purposes, an internal matter of our nation, which the north and the south should resolve on their own responsibility. Therefore, they should acquire a steadfast stand and viewpoint that they will resolve all the issues arising in bilateral relations on the principle of By Our Nation Itself. The south Korean authorities need to know that they will gain nothing from touring foreign countries to solicit their help on the issue of inter-Korean relations, and that such behaviour will give the outside forces, who pursue dishonest objectives, an excuse for their interference and complicate matters further. Now it is not time for the north and the south to turn their backs on each other and merely express their respective standpoints; it is time that they sit face to face with a view to holding sincere discussions over the issue of improving inter-Korean relations by our nation itself and seek a way out for its settlement in a bold manner. As for the Winter Olympic Games to be held soon in south Korea, it will serve as a good occasion for demonstrating our nation’s prestige and we earnestly wish the Olympic Games a success. From this point of view we are willing to dispatch our delegation and adopt other necessary measures; with regard to this matter, the authorities of the north and the south may meet together soon. Since we are compatriots of the same blood as south Koreans, it is natural for us to share their pleasure over the auspicious event and help them. We will, in the future, too, resolve all issues by the efforts of our nation itself under the unfurled banner of national independence and frustrate the schemes by anti-reunification forces within and without on the strength of national unity, thereby opening up a new history of national reunification. Availing myself of this opportunity, I extend warm New Year greetings once again to all Korean compatriots at home and abroad, and I sincerely wish that in this significant year everything would go well both in the north and in the south. Comrades, The international situation we witnessed last year was clear proof that our Party and our state were absolutely correct in their strategic judgement and decision that when we are confronting the imperialist forces of aggression who are attempting to wreck global peace and security and make mankind suffer a nuclear holocaust, our only recourse is the power of justice. As a responsible, peace-loving nuclear power, our country will neither have recourse to nuclear weapons unless hostile forces of aggression violate its sovereignty and interests nor threaten any other country or region by means of nuclear weapons. However, it will resolutely respond to acts of wrecking peace and security on the Korean peninsula. Our Party and the government of our Republic will develop good-neighbourly and friendly relations with all the countries that respect our national sovereignty and are friendly to us, and make positive efforts to build a just and peaceful new world. Comrades, The year 2018 will be recorded as another year of victory for our people. At this moment when this year’s gigantic march has begun, I am filled with confidence that our cause is ever-victorious as it is supported by the people, and I harden my resolve to make devoted efforts to live up to their expectations. The Workers’ Party of Korea and the government of the Republic will never cease to struggle and advance until achieving the final victory of the revolutionary cause of Juche by relying on the trust and strength of the people, but surely hasten the future of a powerful socialist country where all the people lead a dignified and happy life. Let us all march forward dynamically towards fresh victory of the revolution by displaying the unyielding mettle of heroic Korea under the leadership of the Workers’ Party of Korea.